Every maker has a story. Be a part of T & D Rustic Reflections's story by placing an order, leaving a review, and seeing your review appear here. Darrin made this cabinet for our dining room and I absolutely love it! We were browsing an old antique shop on a Saturday afternoon and fell in love with a few different cabinets and decided to take components we loved from each piece and make our own design. This cabinet is constructed of repurposed, aged cedar. 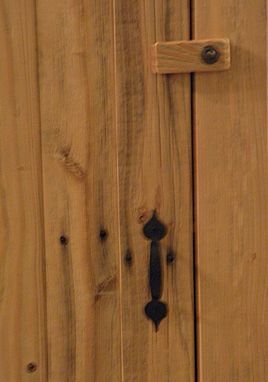 We love working with reclaimed wood, not only for the variances in color and texture that make each piece unique, but also for the fact that with each piece of cedar we use, that is one less piece of wood in the landfill. Darrin sanded each piece of wood by hand and we have left the cabinet unfinished to retain the wood's original natural beauty. I have my cabinet in the dining room and it stores all of my supplies for our various projects. 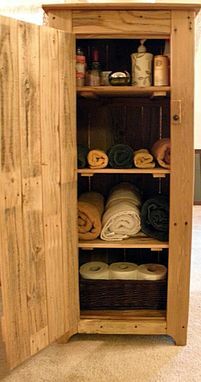 I can also envision this cabinet in a bathroom to hold towels, soaps, etc.